According to Matt...: Glorious Granny Greatness!!! After many hours, dozens of colour changes and hundreds of ends to sew in, I've finally finished my latest granny square blanket!!!! I've got to tell you, I'm sooooooo very very proud of it!!! I began this project back in December. It started when I received eight bright and beautiful cones of scrummy yarn, as Christmas present from Dennis. I couldn't have asked for a better Christmas present! Gorgeous Merino wool and an endless amount of possible things I could make. After browsing through Ravelry, I finally settled on what I was going to make with my lovely yarn. I decided upon another 'Summer Garden Granny Square' blanket using the pattern by Lucy at Attic 24. I had made one of these as my first project. I thought it would be nice to revisit the 'Granny Square' and see what I came up with this time around. Christmas Day evening I got down to making my first batch of squares! I made each square consist of three rounds, with three colour changes. I had decided that the fourth round (which I would do later) would be crocheted using the same colour for each square. I tried my best to make each square different from the previous ones. Hopefully making it so that every square in my blanket was unique in its colours. This was the first project in which I have been extremely strict with myself. I told myself that I had to sew in the ends as I went along. I didn't want this to be a project that never got finished! I knew that if I didn't sew the ends in as I went along, I would never get around to sewing them in. So each time I completed a square, I would pop it in my little brown box. I would keep the little brown box of squares in my bag. Every time I had a free moment alone, I would sew in the ends and then take them home to put in a bigger box of "finished squares". I worked very hard on my squares and before I new it I had a mountain of them sprouting about the apartment. Once I had made a substantial amount of squares, I spread them on the floor to figure out how big I wanted to make the blanket. I settled upon 16 squares by 22 squares, 352 in total. After getting a little bored of making the same three rounds, I decided to buy my connecting colour of yarn and start the exciting process of joining the squares. I settled upon white yarn as it matched the theme of the bedroom and I was planning on keeping this blanket on the bed. In order to start joining my squares, I had to have 32 completed (2 rows of 16 squares). I got cracking with my white fourth round! Once I had finished my first 32 squares, I joined them with single crochet stitches. I wanted to join them this way so that it would make a ridged effect on the blanket. In order to get this effect I had to join the blanket vertically before it could be joined horizontally. I loved joining the squares! It really gave me a sense what I was making and achieving. I was no longer making 'Granny Squares', I was making a blanket! Every time I finished 16 squares I would join another row to the blanket. Over the course of a couple of months I finished my 22 rows of 16 squares. I was finished with my square making!!!! WOOOOOOOP!! This meant that I could join the squares horizontally and close up the big holes in my blanket. Do you see how joining with single crochets vertically and then horizontally made each square have a ridged border? I'm so happy with how this effect turned out! Once I had finished with my end sewing it was time for the finishing touch of a border. I bordered the blanket by doing clusters of three dc into the holes of the outside Granny Squares. Then a round of half double crochet into the stitches of the previous round. Finally I finished it off with a border also by Lucy of Attic 24. I am tremendously happy with the border and think that it finishes of the blanket perfectly. It's cute and simple and a nice contrast to the multicoloured main section of the blanket. So there we have it! 9 weeks later and I'm done with what has to have been my favourite of all my crochet projects!! Are you ready to see it in all of its complete loveliness? It was a little tricky to get it all in the frame, but I did my best! I am quite simply in love with the outcome!! Lying on the bed, so bright and cheery. It compliments our room nicely. Its the most rewarding feeling having your creation snuggled up around you! Giving warmth from the luxury of the thick wool and the heat of the bright sunny colours!! I'm definitely chuffed to bits with my blanket! These Granny Squares have certainly made me a very HAPPY CHAPPY!!! PROUD PROUD PROUD PROUD!!!! What a fantastic and beautiful result! I can't believe anyone would have the patience to finish such a long project, and I think those loose ends would have been the end of me. Congratulations! I just pinned it for you too, I think it's gorgeous. I need more sleep... :) have a great day! Wow! Just breathtaking! I just love your color choices. You should be proud. Its a work of art! I love this blanket and the pillow you made to go along with it. What size will the blanket fit? I need one for a King size bed. It is an absolute stunner, every end sewn is was worth the end result. Beautiful! Wow, your blanket is really gorgeous =) I love it. I wish someday I can crochet one like this. Hi from Paris - France. What a gorgeous blanket! Just looking at it brings warm, happy feelings. Great job! Makes my heart skip a whole beat! And a definite YES on the pillow idea. Wow - that is gorgeous!! You should definitely be proud, what a stunning blanket! I don't comment much on blogs but WOW!!!! You are such a prolific and neat crocheter. The blanket is truly fabulous! BRAVO! 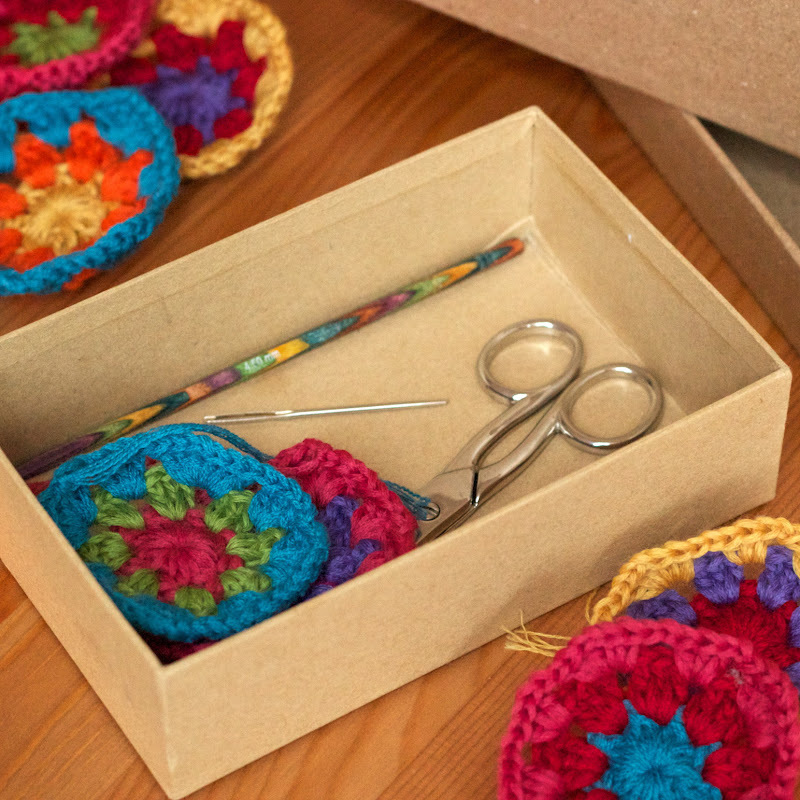 I absolutely love the white edging--- The photograph of your colorful happy blanket is fantastic...you have a very artsy eye for composition and color :) I also love the little cardboard box you put your crochet hook, scissors and tapestry needle in, great idea to sew in ends as you go. I do that too. I agree WOW!! You should be proud because it is magnificent. Wowie!! I love your blog so much and this is absolutely breathtaking! It's so pleasing to the eyes! Absolutely amazing blanket! And the idea of ridged borders is perfect! the blanket is beautiful and the colors so vibrant. Hi i love your blog and your outlook on life..can we ask were you got your wool from? ?i cant wait to watch and see if you guys ever decorate if you guys decide on haveing kids..love love your blog..
Oh my goodness! That is one beautiful blanket - I'm not surprised you're proud of it. Gorgeous. p.s. I have just pinned your blanket to Pinterest. Hope you don't mind. Let me know if you'd rather I didn't. I bought Matt the yarn cones at Hamburger Wollfabrik, which means Hamburger Wool Factory. 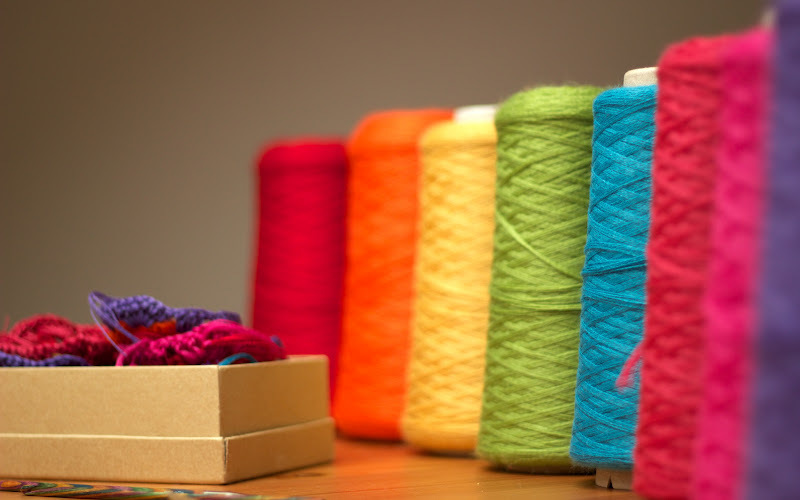 It's an awesome place, where you choose what kind of yarn, in which color, how many grams, and how many ply. Everything is possible! And it's not even expensive! Cheaper than buying in stores! Your blanket is simply beautiful !!!!!!! I love it. The colors are amazing. Very nice job! Most. Awesome. Blanket. EVUR! :D I saw this on Instagram the other day too and loved it instantly! ps Wanna pop over and see my blog too? :) acreativebeing.com! Matt this blanket is absolutely stunning! Wow its amazing, I just finished a blanket myself and know how you feel! Congrats Matt - your blanket is absolutely gorgeous! The white really finishes it off beautifully. No wonder you're in love with it!!! It's just stunning. I bet it makes you smile every time you see it. 352 squares!!!! I'm nearly bursting into tears thinking of it, that and all those ends! No wonder you had to be disciplined to do it! Well done you, that's certainly a real accomplishment. No wonder you love it, it's absolutely stunning. You're blanket is absolutely beautiful! May I ask where the cones of Merino Wool came from? I live in The Netherlands, but I never have seen such cones before. I think they're easier to work with. I hope you can help me! Vibrant & delightful! Simply gorgeous. Very well done! Started back in December! Oh my, you are a quick maker. Absolutely stunning. Makes your room perfectly ready for lighter days! :D Well done! Wow, you should be proud, it is absolutely gorgeous and I'm so jealous. Enjoy your beautiful blankie. WOW!!! This is gorgeous!! Soooooo fresh! I love it! Bellisimas tus mantas! !Felicitaciones desde Argentina!!! I just found and have started following your blog through Alice at Crochet with Raymond, and it's just adorable! Matt! Hello! This is my first time here, I also came trough dear Alice from Crochet with Raymond. Your blanket is amazing! 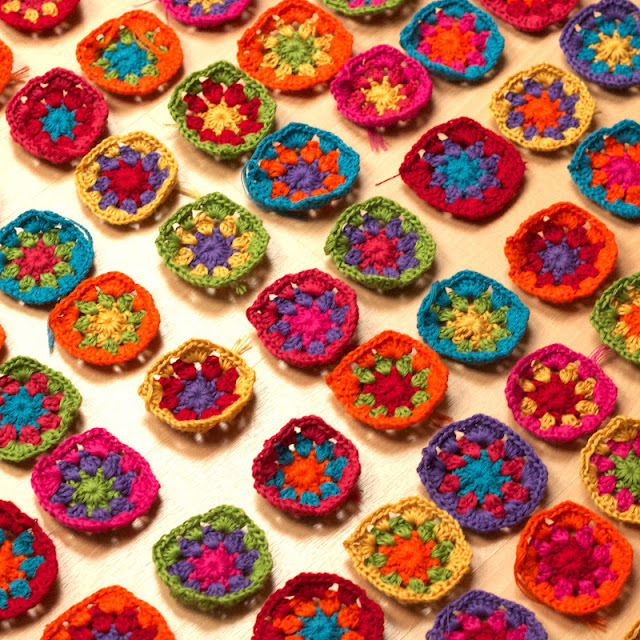 Really inspires me, I started following, so I'm ready to look at more lovely crocheted goodness here. :) Have a nice day!! The blanket is absolutely gorgeous! And I'm impressed with you (mostly) keeping up sewing in the ends in as you went...I never do that and then the end just drags on and on and on! Matt, that blanket is definitely a work of art! What a wonderful treasure, an heirloom for sure. It's a feast for the eyes! Absolutely gorgeous! You must be very proud to have made such a beautiful blanket. really love your blanket it looks amazing!!! I've been looking at all your other projects too, they're all amazing!!! I also found your site today via "Crochet with Raymond" I'll be dropping in more often that's for sure. A fabulous piece of work and so inspiring with all that lovely colour!!! I'm new to your blog and looking forward to an interesting and colourful read, thanks for sharing!! So lovely!!! love the colours!!! i'm new to your blog, just love your projects. Thanks for your comment! The wool was 'kind of' double knit. It was for a 4mm hook. Glorious Granny indeed! It's just stunning. The colors capture your personalities so completely. Wow, your blanket is absolutely fabulous. WOW, this blanket is gorgeous! I was referred here by Alice of Crochet with Raymond, who also loves beautiful bright rainbow-colors-- you should check her out if you don't know her blog already! And your whole blog is beautiful; your photography is fabulous & the design here is lovely. Hello! Thanks for your lovely comment! We are also fanatic readers of Alice & Raymond's blog! Her work is stunning! Thanks for visiting us!!! Have a lovely day! Gorgeous blanket!!! I love going to both Alice's and Attic 24's blogs. So glad Alice shared your link! I'm going to have fun browsing and reading up on your projects! Hi, I've only just discovered your blog and had to leave a comment to say WOW! This is the most stunning and inspirational granny blanket I thnk I've ever seen... You have every reason to feel proud, it is beautiful! I arrived at your blog from crochet with raymond. I love the blanket you made. It gives me a lot of inspiration. what an amazing blanket! I would not have thought of joining the bright colours with white, but it realy makes those colours pop! You deserve to be proud of your achievement the blanket is a work of art. Wow! I love your blanket and the colours are simply beautiful! I wish I had the patience to take on such a big project, I might have to enrol my sister on a joint mission! Such beautiful reward for your hard work! I'm sure you feel a sense of pride and accomplishment whenever you walk in the room and see it! Congratulations! The blanket is amazing! Wauw, it really is amazing! I love this blanket! This is quite possibly THE most gorgeous blanket I've seen! Stunning! And I commend you on seeing in ALL those ends, I hate that bit. couldny stop reading it over and over again. untill this afternoon. Wow!! I only discovered your blog today - I love, love, love your blanket! I'm always a little cautious about using white in my crochet but it looks stunning in your gorgeous blanket - well done you! Wow, I am coming here for the first time and I am soooo in love with the first post I see. I can't wait to see the older posts. Just can't write anything more... eager to browse your blog more. Keep up the lovely work! Matt! You owe me a new keyboard, because I just drolled all over mine. and I didn't have the chance to leave a comment then. But wow. This blanket is so beautiful. I know I always say this, but i just love the combination of white with those happy colors. And in this project it looks even better! I simply LOVE the blanket! Well done! What a work that must have been. Aren´t you happy every time you look at it? Wow, you have every reason to be proud! Lovely and brilliant! I am making a similar blanket, and was going to connect my little squares in your fashion. When you connected them did you single crochet through both loops of both squares, or just the fronts? And is this single crochet English, or American? Thanks for the help! I love it!! Thanks so much for posting it at Link Your Stuff on my blog. I noticed you already got a few votes. 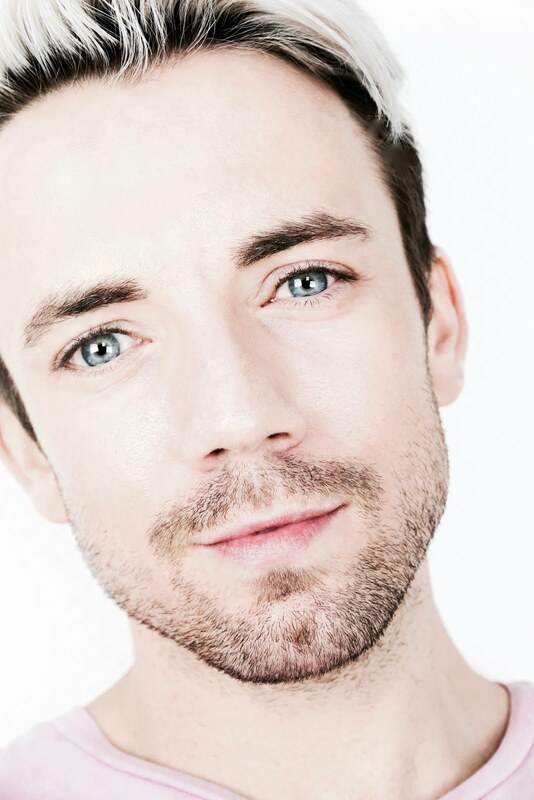 I hope you get the most votes, because you deserve it after doing so much and such gorgeous work! Have a lovely day! Very nice creations. This quilt is my dream. Heb je misschien het patroon voor me? Coming a bit late to this but this is such a happy blanket! So pretty and bright. Great job! I really love this blanket. The colors are so great.... do you know any equivalent yarn available in the Netherlands? Can you make an ingredient list for the blanket, so I know how much I would need for a blanket. Or maybe the Hamburger Wollfabrik can start selling a special 'Matt blanket pack' like they sell in the UK for Attic24's granny stripe. I think a lot of readers would like to order one. I have just found your Blog after looking for hope in my little blanket. I am using the same pattern and feel like I am not getting far with my blanket. I was so glad to find your blanket and has inspired me to keep on going with mine (although mine will be quite a bit smaller). It looks amazing, thanks for inspiration. What a wonderfull!!!!! Absolutely gorgeous!!!!!! Que maravilla de trabajo, es espectacular!!!!!!!!!!! Hi Matt & Dennis! What size hook did you use for this? That wool looks teeny tiny! This blanket is stunning. It is colourful yet so soothing to eyes because of white border. Beautiful and very neat work. After a very long time resisting the urge to crochet, I finally gave in, after my knitting buddy (who's a crochet fiend herself), taught me how to make granny squares AND your incredible blog. And I've also pinned a picture of your blanket onto my "Queued" board! I wish you could see the expression on my face as I involuntarily and spontaneously applaud my computer screen. How beautiful! Just, wow. Wow. This is amazing. Es una belleza, se ve que fue tejida con mucho amor,hay que darle gracias a Dios por este don tan hermoso que te ha regalado. Me gustaría saber con que tipo de lana o hilo hiciste esta obra de arte. Hello Matt, I have just now found your blog from a link through Pinterest. Let me say that your projects are simply a joy to look at....all that bright color and obviously excellent workmanship. Each post drew me to the next one, just to see what you've been working on. Would you mind sharing/posting the color names of the 27 you used in the Granny Square sequel afghan? And also this wonderful white & bright afghan you show above? The Granny Square is so quick and easy to make, and your photos have inspired me to try a blanket of my own. Many blessings to you and your stitching hands!!! Piglady612 in Texas. I too would love to know the 27 colors used! They are so vibrant and work so nicely together. What is the weight of the yarn? You finished that in 9 weeks? Woww.. thats indeed a great project.. Lovely colorss.. and the white adds beauty to it.. Love it!!! This is definitely the loveliest blanket i have ever seen! I have seen many but this is just perfect with the fresh white. Love it! GORGEOUS !! What a WONDERFUL Christmas gift !! Such beautiful cones of glorious happy colors !! I LOVE LOVE the blanket it's just beautiful !! I am envious of how you put your fabulous colors together. The granny squares and granny stripes etc. always turn out beautiful !! Love It !! Hola MAtt!!! Qué tipo de hilo es? lana? algodón? es muy bonito??? What a beautiful Afghan! I first saw it in the bookstore. Loved all the photos (so very bright and cheery) and the article. 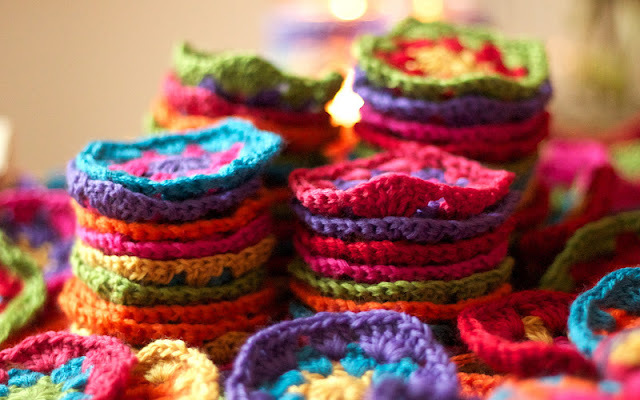 Have only been smitten with one other crochet item, Bohemian Oasis by DROPS Design. Thank you for making such an inspiring piece. Hey, it is a great job you did in this lovely Afghan! Congrats! Just found you through facebook - such a beautiful blanket!!!!! Can you tell me how much yarn (weight) was on each of the cones used to complete this blanket? Amazing! I need to find myself some Merino yarn, it just looks so warm and soft! Just beautiful....you must have endless patience. Bravo! Beautiful! Hope to see the matching pillows. Love this sort of crochet, I bet all that work was worth it to make such a gorgeous creation!